I visited the exhibition one Saturday afternoon (my second visit after attending the launch event) and was the only one there, save a few children and their mother using the colouring materials, so I made myself at home. And what a lovely few hours it was – learning anew the history of Grunwick. Another quote from a Grunwick striker read: ’We had to work there because we were trapped’ – this could just as easily apply to the migrants today who prop up the UK’s hospitality industry and the farm labourers who keep us in fresh ‘ready-made’ salads and spiralised courgettes and cauliflower cous cous. 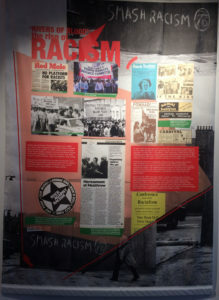 The exhibition is, rightly, situated in a historical context and the racism that ‘first generation’ Asians and African Caribbeans were suffering at that time. The strike was seminal, both in terms of labour relations, but also because it put paid to the stereotype of the ‘passive’ Asian community. Located in a room in the Brent Library, the exhibition is innovatively designed and packs a lot into a small space. 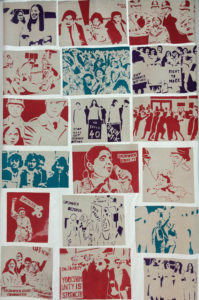 Banner panels float at the walls and down a timeline walkway adorned with pictures, newspaper cuttings, remade and real placards, leaflets and flyers for demonstrations, official documents and the original Grunwick strike committee banner (on loan from the People’s History Museum in Manchester), all of which tell the story of a determined band of mainly Asian workers who fought for their employment rights and put the Asian workers’ lot at the centre of union concerns. Every bit of available space is used – the floor contains a timeline, windows display the iconic pictures and screen prints created in one of the community workshops. There is a beautiful bronze bust of Jayaben Desai too. The creative and inventive project has involved the local community from start to finish. Last year community workshops were held in a local community centre and people were invited along to share their memories, photographs and cuttings from the time. The workshops also aided the design of a mural – which will be unveiled later this year. The local Brent Museum & Archive was also an invaluable source of materials and historical documents. (And the IRR was also able to assist with materials from its Black History Collection). 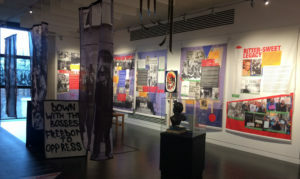 Since the exhibition’s launch last year, a number of events have been held – to link the past to the present: Fundraising showings of the film ‘The Great Grunwick Strike 1976-1978: A History’ with talks by those involved; a conference ‘From Grunwick to Deliveroo: getting organised, getting unionised‘ which drew parallels between migrant workers then and now. 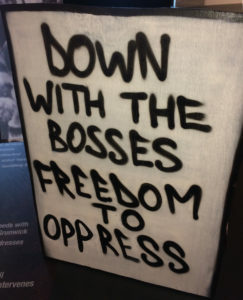 Another event, ‘Strikers & spycops – from Grunwick to now’ examined the recent revelations that the Grunwick strikers were spied upon by the police and that police provocateurs were involved in the strike. And this month there will also be a one-day symposium, ‘The Art of Protest’, to explore how art and music has supported and been inspired by struggles for equality – particularly around race – over the past forty years. Congratulations should go to the team that brought those behind the strike back to public consciousness – teaching new generations the importance of action and solidarity. The creation of the exhibition is clearly a labour of love from those who recognise the importance of Asian women willing to go the extra mile for what they believed was right. 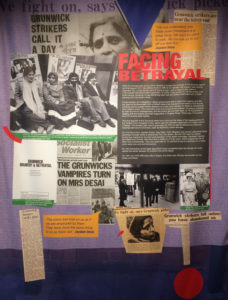 The opening of the exhibition last year to commemorate the fortieth anniversary of the strike, was a lovely event – where Meera Syal spoke movingly of the importance of Grunwick to the Asian women who came after. Perhaps the strikers could be immortalised on the big screen? But most impressive were the strikers (the men and women) now older, but shocked that a room could be packed to celebrate their achievements and their history. When two of them thanked me and my sister for coming, we had to smile as it was we, in turn, who had to thank them for their bravery and their example that shows that fighting is worth it. They were unassuming and humble to the last. 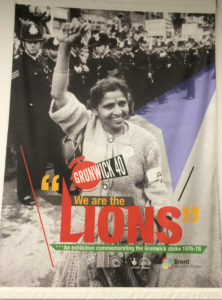 ‘We are the Lions’ is being exhibited at Brent Museum & Archives, The Library at Willesden Green, 95 High Road, London NW10 2SF until 26 March.